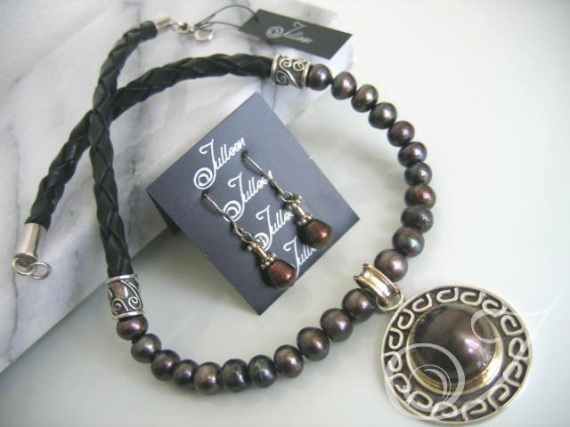 Lustrous 15mm Chocolate Mabe Pearl, on magnificent sterling silver, Celtic design 30mm pendant. Silky smooth brown 8mm button pearls on sterling silver hand made raised wire spacers with divine braided 6mm leather, create some lovely textures that will appeal to the woman who loves something really unique, that absolutely stands out from the crowd. What a stunner! For bridal parties with a chocolate theme or for beige, cream, bisque and almost any blue colours. If you would like to buy the pieces of this set individually please contact us and quote product code PDL006 for the necklace and E017.09A for the earrings.